` Swimming pool is a center of fun for the whole family and if you have one or thinking about building one in your backyard, safety of your children should be a priority. Drowning is a leading cause of child deaths in the U.S. Fortunately, there are several measures you can take to ensure safety of your loved ones. Supervision You should have eyes on your child at all times. Accidents occur when we assume our children are being watched by someone else. If your child is missing, pool should be the first place to check. Swimming lessons Best way to ensure your child is safe in a pool is to teach them how to swim. You can book a professional swim teacher who will report back to you about your children’s progress. Also, teach them pool rules, put it on your fridge, poolside, do whatever you can to make it clear. Barriers All barriers should be maintained and kept locked. It’s easier than we think for a child to slip through an unlocked gate straight into the pool. Even if you have to check 500 times a day, if you’re unsure you locked it, check again. You can surround your pool with a fence, keeping all climbable objects out of reach or install an alarm that will notify you if your child manages to gain access to the pool. Infant Child CPR Certificate every parent should have. In case of emergency, you should be able to help your child. Keep a phone near the pool at all times, in case there is ever the need to call 911. All four measures should be interlinked; one won’t ensure you child’s safety without the others. AMS Financial can help you with all types of in ground and above ground vinyl liner swimming pool loans. We even offer bad credit pool loans, so for less than perfect credit there may still be the possibility to finance your swimming pool. Have fun, safely. 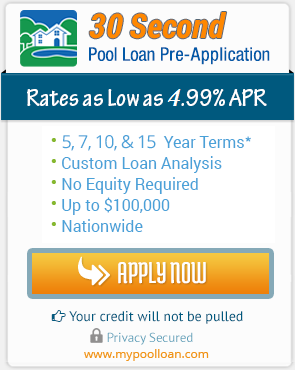 Bad Credit Swimming Pool Loans — Are They Available? Pool financing is heating up. Time to get started on your Pool Loan.